We had a very productive meeting with the Secretary and thank him for taking the time to hear our concerns, to visit Hetch Hetchy, and to consider returning the valley to Yosemite National Park and the American people. 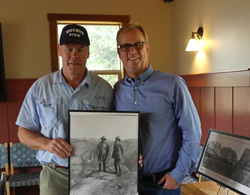 Restore Hetch Hetchy met with US Secretary of the Interior Ryan Zinke this weekend in Yosemite National Park to discuss restoration of Yosemite Valley’s twin, the Hetch Hetchy Valley, which is buried under 300 feet of water. Restore Hetch Hetchy is requesting that the Department of the Interior initiate a department level study of the opportunity for restoration of the iconic valley to its natural splendor - and to the American people. Yosemite’s Hetch Hetchy Valley was clear cut, dammed and flooded over 100 years ago, making it inaccessible to the American people. The destruction of the valley, which John Muir called “one of nature’s rarest and most precious mountain temples,” drew opposition from more than 200 newspapers across the United States and helped spur the modern environmental movement. “We had a very productive meeting with the Secretary and thank him for taking the time to hear our concerns, to visit Hetch Hetchy, and to consider returning the valley to Yosemite National Park and the American people,” said Restore Hetch Hetchy Executive Director Spreck Rosekrans who, along with Restore Hetch Hetchy board members, accompanied the Secretary on a tour of the flooded valley. Among the issues Restore Hetch Hetchy is asking the study to consider are the best way for San Francisco to meet its water storage needs without using Yosemite’s Hetch Hetchy Valley as a storage tank and the value to the American people of restoring Hetch Hetchy valley as enjoyable national park land. The organization is currently pursuing restoration through the California courts, while also broadening awareness of the possibilities and benefits of restoration, including the recent launch of its ‘Walk the Valley’ campaign which asks nature lovers, Yosemite lovers, National Parks lovers, and adventurers from all walks of life to take a pledge to walk in a restored Hetch Hetchy Valley . Citizens who are interested in joining campaign to restore Yosemite’s Hetch Hetchy Valley can find out more at http://www.hetchhetchy.org. To join the “Pledge to Walk the Valley” campaign and to ask others to take the pledge, go here. To view the Walk the Valley video, click here. To view the Hooray for Hetch Hetchy video, click here. To access a “Walk the Valley” facebook frame, click here. Restore Hetch Hetchy’s mission is to return the Hetch Hetchy Valley in Yosemite National Park to its natural splendor while continuing to meet the water and power needs of all communities that depend on the Tuolumne River.